Set of 2 dies. "Happy" measures 1.75" x 1.1" and "Anniversary" measures 3.3" x 1". Impression Obsession die featuring the sentiment "Happy Anniversary". US-made steel die compatible with most table-top die cutting machines. This is a set of 2 dies. 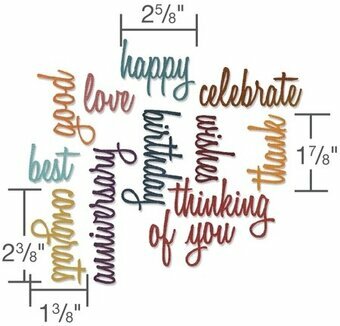 The anniversary word is approximately 1 x 3-1/2 inches and the happy is 1 x 2-1/4 inches. 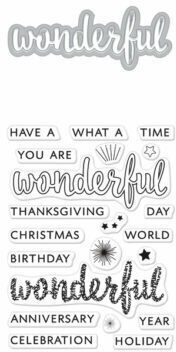 These are no ordinary stickers. Each sheet features a specialty treatment like glitter, flocking or foil. Perfect for that extra bit of pizzazz. This product is one of the Miniature Moments Die Sets. This particular die set has one sentiment die in and reads "Happy Anniversary". It makes a perfect addition to any craft project that you are making to add that finishing touch. With a great unique design this will help your crafting project stand out from the rest.